For the most part, accessing the Internet from a mobile device, like a tablet or phone, is just as safe as doing it from a desktop computer. However, there are a few nuances specific to mobile access and understanding them can prevent unwarranted attacks on your device. To understand potential problems, it is necessary to break down the concept of mobile access into its two basic components: mobile broadband and Wi-Fi. Wi-Fi can be further divided into public or private Wi-Fi. Mobile Broadband is the 3G or 4G systems that phone companies are always touting - usually with claims that their system is faster than those of their competitors. Providers like Verizon and ATT secure the broadband and work to prevent spam, malware and other malicious attacks on the system at large. This, in essence, reduces the risks for mobile devices like phones and tablets from being infected with a virus. Private Wi-Fi, accessed through a router - like the one you most likely have in your home - is another secure way to access the Internet, especially if you follow the practice of password-protecting your router. Your router can serve as a firewall to prevent unwanted attacks on your machines. Of all the access points that have the most potential for risk, public Wi-Fi tops the list. If you access the Internet via a public Wi-Fi connection you should operate under the presumption that any content transmitted is not encrypted. If you are using a public Wi-Fi to send email, don't send sensitive information, unless you encrypt it from your device. There are ways, though, to use public Wi-Fi and still have a reasonably high level of security. If you work, for example, from a coffee shop and use their free public Wi-Fi, you can do the following to make your browsing more secure. Use a Virtual Private Network service, because this encrypts the data transmission from your device. For example, if you are using a VPN when you go to your Facebook page and enter your username and password, all the content is encrypted when it 'leaves' your machines and is loaded into Facebook. Also, when you are connected to the VPN, the router's settings on the public Wi-Fi you are using are bypassed, so it will not impact you even if the settings have been hacked or compromised. Hackers may set up a similar name in an effort to lure you into the wrong access point. If you do not know the name of the network, check with the owner. If you are using a Windows device, you can go one step further and check the security level of the network. If you use web-based email services, like Gmail or Yahoo, make sure you are using the https link to connect to your account. This will ensure you are using the secured link and that you emails will be encrypted. If you have an Android device, you can encrypt everything that exits the machine, by going to Settings->>Security->>Check Enable Encryption. The encryption applies to network traffic as well as all the data - like application data or download information. The encryption means, however, that the user can't access any data without the right password or PIN. Most devices default to having the firewall software turned on, but if you are accessing a public Wi-Fi always double check that the firewall software is, in fact, turned on. You can access the software through the Settings feature of your device. If there is also an option on your device called 'Block all incoming traffic', turn that feature on as well. One of the most popular features on smartphones are apps - they seem to be available for just about anything. Apps do pose some special security risks, so it's important to be aware of how to use them safely. Banking apps are one area that has some consumers concerned about safety. 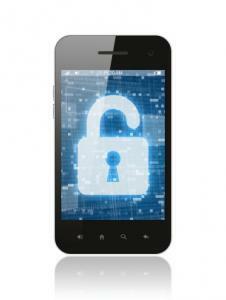 Any security issues related to mobile banking are more about the phone than the app. The app communicates directly with the bank's servers and uses the software's security algorithms to ensure that the phone and bank should, in fact, communicate. The real safety issue is all the data that is stored on your phone, since it could be accessed if it fell into the wrong hands. However, if you require a PIN to access the phone, that should eliminate the risk. However, it is better to also disable on-phone storage of sensitive information as your fail-proof plan. This way, if the phone is lost or stolen a password is needed to open the phone and then a login and password would be required to access your banking information. When putting any app on your phone, only download the app from a reputable source - usually the Apple Store or Google Play. It is also in your best interest to keep all apps current with any updates, since some updates may be designed to solve a recently discovered security issue. In addition to taking steps to stay safe on public Wi-Fi and being careful when downloading apps, there are other factors to consider related to mobile device security. Just like with apps, you need to keep the software and operating systems on all your devices, whether it is a phone, tablet or laptop, updated. This is because any corrected security issues will be patched and installed on your device via the update. You should also lock your phone or tablet with a PIN or password in case it falls into the wrongs hands. This protective measure will make accessing your personal information more difficult for an unauthorized user. If you are concerned about banking or identity theft issues, you can also set up your device to remotely wipe out your personal information so it cannot be accessed.